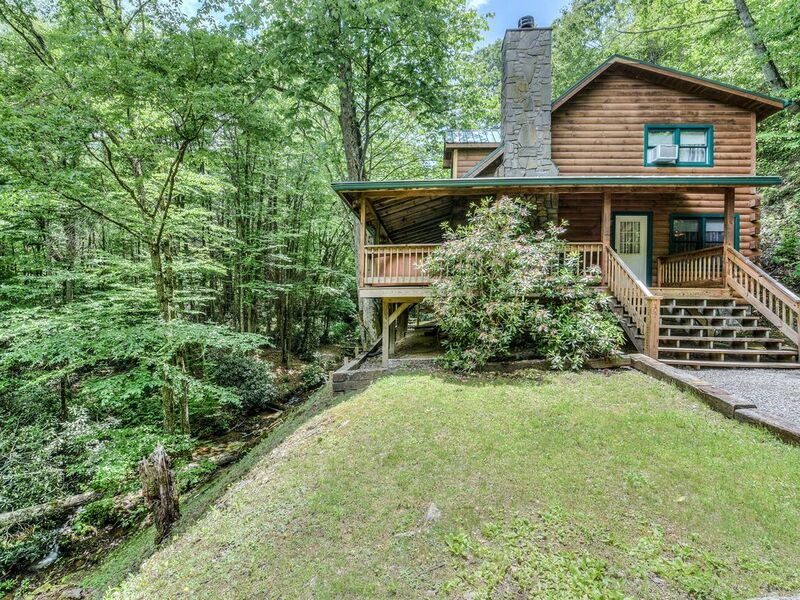 This is a beautiful, Non-Smoking, log cabin home on an acre of land, situated on a rushing creek with several waterfalls right outside the door. The lot is wooded and sits at about 4200 feet elevation. It feels very private, yet is only five minutes from the main road. There is a large covered porch running the length of the cabin overlooking the creek, with a six-person hot tub on one end. In the yard is a picnic table and steps down to the creek. The furniture is plush and comfortable, and with a woodburning fireplace and satellite television, there isn't a more cozy place. You'll be only fifteen minutes from the quaint town of Maggie Valley, where there are several wonderful restaurants and lots of craft and gift shops, as well as gorgeous mountain views. Going the opposite direction takes you into Cherokee in about ten minutes, with gambling casinos and tourist attractions, or you can take a drive on the Blue Ridge Parkway. In 20 minutes you can be on Main Street in Waynesville, with restaurants and shopping galore. Asheville is just 45 minutes away, and Gatlinburg, Tennessee only an hour or so. 4x4 is required during the winter time, if a lot of snow. The cabin is located 4200 feet up the mountain on a hard packed gravel road (always check the weather). Enjoy the very secluded area around the cabin. There is parking for 3 vehicles. It is not motorcycle accessible. Cataloochee Ski Resort is just a few miles away. Great place to get a way for a few days. Quiet and peaceful. Thank you so much! So glad you enjoyed your stay. Look forward to you returning in the future. The grounds are amazing and beautiful. We were really pleased with the property. The hot tub is settled into an amazing scene of rhododendrons and there’s an amazing sound coming up from the creek. It rained a ton while we were there. A ton. So we nestled in and played games, built fires and watched movies. We’d go back! Only complaint, both beds are super soft. And noisy. But that seems to be par for rentals. So glad you enjoyed your stay. Thank you and look forward to your return visit. Thanks! Glad you enjoyed your stay and look forward to you returning. We had the best time!!! The place was beautiful inside and out!! Plenty of room inside and the kitchen was nicely stocked. We found the prettiest waterfall across the creek and up the hill to the left!! Enjoyed sitting on the porch and around the firepit. You can even hear the creek inside the house with the doors shut!! It would be nice to have some sort of light at the back steps (totally dark at night) and some solar lights on the waterwheel and little bridge so you could enjoy seeing them at night as well...We will definitely book this cabin again. Thanks so much and glad you enjoyed your stay. Will definitely look into the lighting. The grounds of this property is absolutely gorgeous!! Breathtaking views! Especially for a city girl. The cabin is warm, cozy, comfy and very welcoming! Very nice for a family and/or friends setting. It's also clean and organized. They have everything you need to cook, bake, drink etc. Very equipped, I was actually impressed. .lol The water from the tap is extremely cold and refreshing! It comes straight from the creek, filtered. No need for bottled water. Lots of attractions as well. We visited Cataloochee ski resort.. great! Soco Falls, Biltmore, Smokey Mountains National Park and a few others. The snow tubing area that's near Cataloochee is no good. I do not recommend it. I did go to Tennessee. We went to Ober Gatlinburg Ski Resort. 1.5hrs from Maggie Valley. Nice as well. Alot of attractions and restaurants. Tram ride, cool! Unfortunately.. we went to snowboard.. not enough snow. Only beginners slope open. Not even 1 lift open. Outdoor activities closed due to weather, fog and rain. Downfall of having real snow, it's unpredictable here. Cataloochee was a way better experience for us and they made snow.. guaranteed skiing/snowboarding..lol. Overall.. an excellent experience in the Great O'l Smokey Mountains. Now... getting to this cabin is a different story. If you're unfamiliar with this area or unaccustomed to driving up and down steep roads... buckle up! It's scary as hell!!! To get to this cabin is down a steep concrete with some dirt/gravel hill, with some turns that has dirt/gravel. When your at the entrance of your cabin, you have to back in to go down the gaveled driveway. It's easiest. Thank God my husband drove, I couldn't do it alone..lol. Good news is, after a couple drives up and down... you get the hang of it and it's not that bad. Thank you for your review. Glad you enjoyed your stay. Ski Cataloochee is very nice and only 5 minutes away. Yes, the trip to Gatlinburg, TN is 1.5 hrs away and is very touristy, unlike Maggie Valley. The cabin is 4200 feet up the mountain on a hard packed gravel road and always tell everyone in the winter, 4x4 maybe required, when it snows. Also, depending on who you get to the driveway others go right past the driveway and turn around then they can drive straight in, instead of backing down, then turn around at the end of the drive. Thanks again and hope you return in the future. Amazing drives along the Blue Ridge Parkway, enjoy a trip to the Biltmore House, Cherokee, or Waynesville. Take a ride over to Gatlinburg, TN, an hour away. There is horseback riding just a few miles away, putt-putt, tubing, rafting and much more. You bring your paper products (i.e., toilet paper, paper towels, napkins), soaps (dishwasher, washing machine, shower), and food. Pets have to be approved prior to accepting payment (type/size). After payment in full, which is due 30 days before check-in total amount is nonrefundable, if cancelled, unless I can rebook dates.